… the engine this year that we had in 2018 was stronger, and it made us more competitive. Q Changing the subject. 2018 MotoGP, from your perspective, overall: how did it change from the previous season from your perspective? A I think the racing, again, in MotoGP was spectacular. Week in, week out, there was battles for the lead. There was only a couple of races where you knew Marc was probably better than everyone else and could win, not quite easily, but was set to win. Like Texas. Like – there was another race where he was just, not head and shoulders above the rest, but he just had that advantage. But then the other races, there was battles. Jorge won two races. I won a race. Rins was there all year. There’s been a lot of – and Dovi put up a fight, as best as possible. It’s nice to go into race weekends not knowing who’s going to win. Or be on the podium. Because Yamaha had some problems. KTM had a podium at the end of the year. It’s nice, I think, that every single year it’s getting better and better and more competitive. 2017 was good as well. But from our side, from my team’s side, from Honda’s side, the engine this year that we had in 2018 was stronger, and it made us more competitive. I think we still have to ride the bike as hard. I honestly do. Physically-wise, pushing the front-wise, and how we ride. I think we still push as much, but I think in a race situation, our engine helped us a lot. It never saved us or anything like that, it just helped us be a bit more conservative in the race. So the 2019 bike is a next step again. Q In 2017, when it was cold, or wet, you looked, at times, really tight on the bike, but we didn’t see that as much in 2018. I think it’s hard for fans to understand how difficult it is for a rider who’s got a vague front tire or front end issue to go fast. Some riders describe it as Russian roulette. What do you think? A I think … it’s hard, because with the Honda, we overstress the front, because we take advantage of Honda’s strong point, and that is the corner entry. But we keep taking, and we bite off more than we can chew, and that’s why we crash with the front, is that we push so hard with the front, because that’s our advantage. It’s not a weak area of the bike. It’s the strong area and we keep taking from it. And that is, as riders, if you say there’s another strong point of the bike, say a motorbike has rear grip, they will blast that rear grip as much as they can, but in the end, it will bite them, because they’ll have no tire left, because if they keep going and going and going, you know – there has to be a balance, but obviously we just get greedy and keep pushing as much as we can. And in the rain situation, in 2017, I was not feeling great, to be honest. And I’ve been on the podium many times in the rain, but 2017 I didn’t have a great feeling. 2018 was a little better in the wet sessions. I don’t think I raced a wet race in 2018. Only the last one, which I wasn’t there, was wet. But I think the Honda’s obviously good in the rain. Marc has made a big step with himself, riding in the rain, over the years. So I’m really looking forward to riding the 2019 Honda, as I said, because there’s been some changes that I think are positive from what I’ve understood and heard, and I think they will help in a lot of areas. Q You switched helmet sponsors to HJC for 2019. 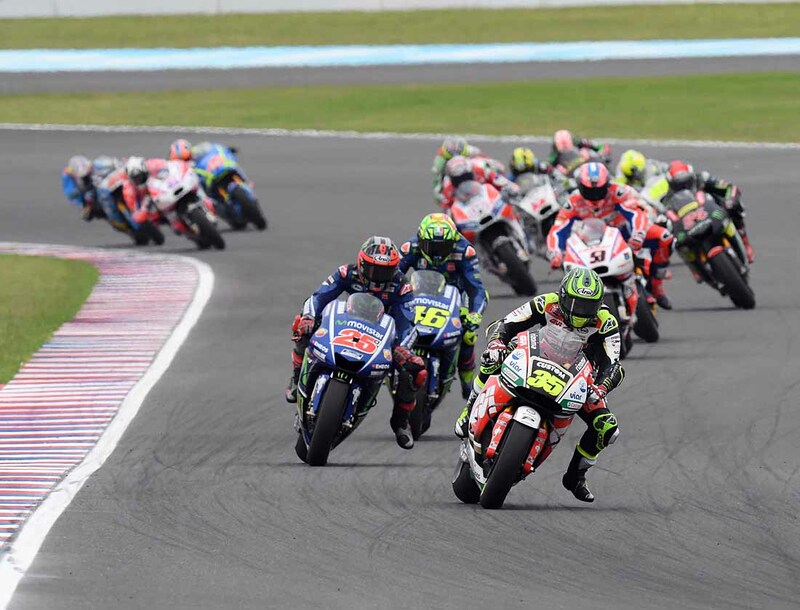 What does that mean for Cal Crutchlow fans? A Good things are coming are coming. That’s all I can say for now. Q You mentioned Marc before. It strikes me that your experience since Phillip Island is the ugly side of life for a MotoGP racer. Crashing, as you say, is a reality. It’s amazing how lucky, how fortunate, Marquez is, for as much as he comes off. A Yeah … I think he’s probably been more injured than what he’s ever let on. Because he doesn’t want to show weakness to anybody else. It’s as simple as that. As Dr. Mir said, he has no idea how he’s been riding with the shoulder that he’s been riding. And I know – you know, you saw it – it pops out all the time. And it was. I remember speaking to him saying he was playing football with his brother, and the shoulder popped out. He had a bad shoulder, simple as that. But riders always have – riders are never 100% fit, I don’t think, because you always have some sort of niggle or something. But like we’ve always said, we call him “the cat” for a reason. He crashes, he always lands on his feet. He’s a special talent when it comes to riding, to being able to push the bikes to their limits, to being able to crash to get back up, the way that he does, and be as competitive as he is.